*Promotion applies to select items only. Excludes shipping charges, individual wine bottles, gift cards and taxes, if applicable. Cannot be combined with any other offers or with previous offers or discounts, including volume discounts. Hickory Farms reserves the right to cancel or modify offers at any time. Valid only on hickoryfarms.com. Not valid in stores or on partnership websites. Other restrictions may apply. The expected in-stock date is Saturday, June 01. Product contains milk, wheat, and soy. Produced in a facility that also processes egg, peanut, and tree nuts (pecans, almonds, coconut, cashews, walnuts). Towering flavors any serious snacker will love digging into! 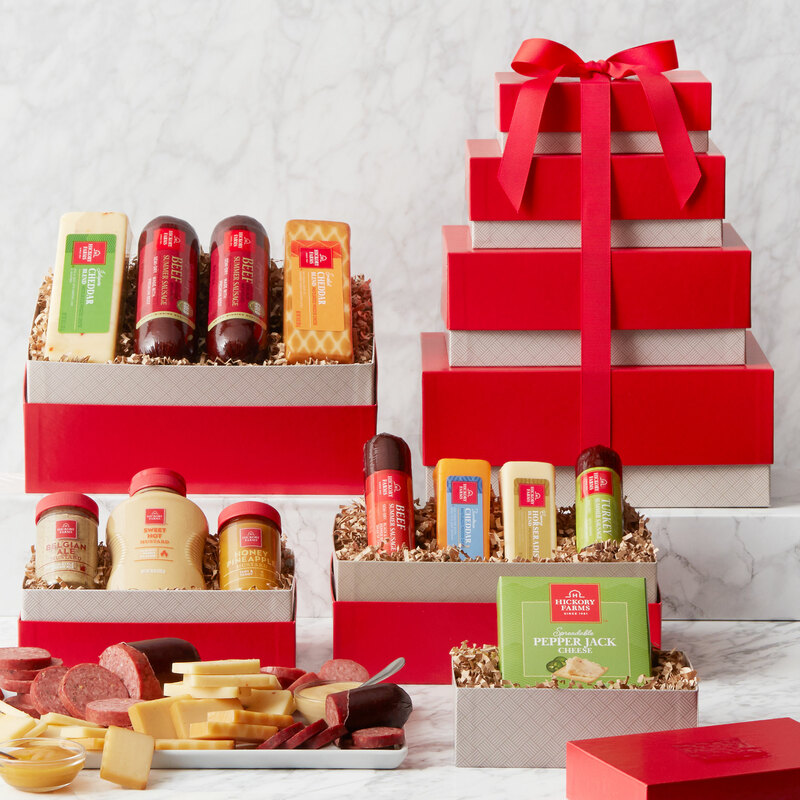 This savory gift tower starts with an assortment of Hickory Farms classics, Signature Beef Summer Sausage and cheeses. Next is a box of bold flavors like Sweet & Smoky Turkey and Spicy Beef Summer Sausages, Horseradish Blend, and Farmhouse Cheddar. Then a selection of our favorite mustards, and the tower is finished off with a delicious Spreadable Pepper Jack Cheese. Send this gift tower as a thoughtful way to celebrate any special occasion. We’re proud to support our armed forces by providing free shipping for this item to APO/DPO/FPO addresses any time of year. During checkout, please select 'Military' as the address type, enter APO/FPO/DPO in the city field, and select the military state option. *Please allow up to 4 weeks for delivery.